FULTON, NY – Oswego County Opportunities, one of the top ten largest private employers in Oswego County, has welcomed seven new members to the agency’s staff. 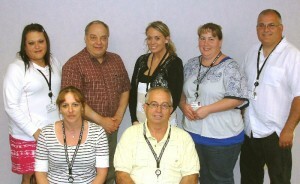 Pictured are new employees of OCO who have recently completed the agency’s orientation program. Seated from left are: Cheryl Killam (Residential), and Theodore Galvin (Transportation). Standing from left are: Tanya Runge – and Wayne Kenyon (Chemical Dependence Services), Emily Anderson (Crisis & Development Services), Melissa Kelly, (Education Services), and Michael Houck (Chemical Dependence Services). Designed to acclimate new employees with the history, mission, and vision OCO, the agency’s orientation provides new employees with the tools, guidance, and atmosphere they need to thrive and continue to grow in their new positions. “We take pride in our workforce and the job that they do. To ensure that OCO employees provide our consumers with the outstanding service they deserve we offer each new staff member every opportunity to become a productive employee and excel in their position. Additionally, our culture is to encourage employees to continue their growth and to take advantage of the many training opportunities available to them,” said Christine Prevost, training coordinator with OCO. Prevost added that OCO’s monthly orientation sessions offer in-depth information on the structure, programming and history of OCO. “In addition to receiving training on mandated items such as HIPAA confidentiality, diversity and Right-to-Know, we discuss expectations and growth as our culture is to encourage employees to take advantage of the many training opportunities that are available and the best way to pursue them. Our orientation session is a full day of training and information that will allow our new employees to build a successful career at OCO,” said Prevost. A private, non-profit agency, OCO’s many programs touch the lives of more than 30,000 Oswego County residents each.